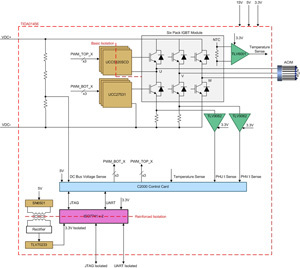 This reference design realizes a 3 phase inverter subsystem for variable frequency AC inverter drives and servo drives. This design is particularly suited for drive architectures in which the microcontroller and inverter ground are non-isolated. The basic isolated gate driver UCC5320S is used for driving the high side inverter switches, and the compact, six pin UCC27531 low side gate driver is used for driving the bottom switches. The result is for reinforced isolation to move to the UART communication channel. 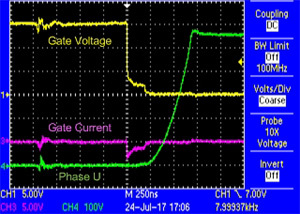 Inverter half bridge leg current sensing is done in two phases using shunt resistors and the dual operational amplifier TLV9062. This drive architecture results in a reduced number of reinforced isolated channels and enables a cost optimized, compact solution. 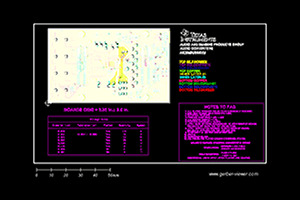 This design is controlled by a C2000 microcontroller.